Declan Devine reacts to the Brandywell crowd at the final whistle. DECLAN DEVINE heaped praise on the passionate Derry City fans who turned out in numbers to roar his side to a thrilling victory over Waterford at the Ryan McBride Brandywell Stadium. Over 3,500 packed into the Brandywell venue on a Monday night as the Candy Stripes made it two home wins on the bounce under Devine. The crowd played its part by ramping up the atmosphere and the players responded with a battling display to get back on the winning trail. Ciaron Harkin got the ball rolling with a superb finish on 14 minutes and when Shane Duggan equalised from the penalty spot in the second half, Devine, who experienced a rollercoaster of emotions on the touchline, reckoned the attendance played a major role in lifting his players. "This is a place where we want to come out and feel really good and we did tonight," beamed Devine. "The relationship between players and supporters is crucial and tonight we both bounced off each other. "The players bounced off the crowd and the crowd pulled us through when it was difficult and we need that. When it went 1-1 the game could've went either way because we missed a lot of chances in the first half. The game should've been dead and buried but when they got their penalty it went a bit flat. I think the crowd really helped us during that period and the players responded to the crowd. "We got on the front foot and got a couple of goals. Even towards the end when it was getting nervy, again the crowd got behind us. It's a collective effort," he continued. "I said from the start I want to get that relationship between players and supporters back and I think everyone from the crowd, the players and staff - everybody came to the party and it was a fantastic night for us." 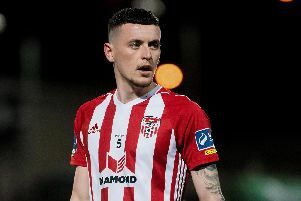 After the disappointment of defeat in Tallaght on Friday night it was the perfect response from Derry and, to a man, they produced a terrific performance which was thoroughly deserving of the three points. "I'm over the moon because we were hurting after Friday night when we didn't do what we were good at. If the players are seen to be giving an effort then our fans will get behind us," continued the Derry boss. "We will be determined we play the right brand of football but at the same time, hunger, desire and effort and winning 50/50 tackles and running will get this place bouncing. I've seen it all my life," he enthused. "When you pay money to watch a Derry City team you want effort and desire and you want to enjoy your night and hopefully everybody enjoyed tonight. It's character building. We're only starting with this group and that's the pleasing factor for me. "We've been in almost everyday since January 3rd. The players have given it everything. They've made huge sacrifices wit their families and friends and wives and girlfriends by being here every day so when they get a reward like that tonight then I'm delighted for them all. "I'm delighted for the fans as well who had a night's enjoyment here. I've enjoyed every second of it and we go away tonight and enjoy it but come back tomorrow and get ready for Cork."